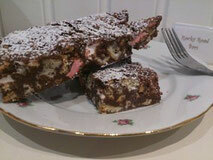 OK, I had to share this simple yet most delicious ROCKY ROAD bar recipe with you all. If you look about, you'll find loads of Rocky Road recipes, and they all differ ever so slightly. They'll call for different quantities (and type) of chocolate used, or of butter, or of golden syrup... and some will add nuts, or dried fruits into them. The real Rocky Road in my mind DOESN'T contain nuts and dried fruits, although you can put them in there for added flavor if you like. The essentials are biscuit pieces (I use Petits Lu, but you can use British Digestives, or Hob Nobs, or any kind of dry biscuits) and miniature marshmallows - that way you get the lumps and bumps of a.... ROCKY ROAD! First things first, there is no need to preheat your oven because these babies don't get cooked - they go straight into the refrigerator. Now get a brownie tin out and ready, which means, if its not nonstick or silicone, you need to line it with cellophane wrap: two long strips that you cross over, one horizontally and the other vertically. Leave lots of extra so that you can seal over the dough once its in the pan. if its professional nonstick or silicone, then it'll come out real easily when you turn over the pan. Now here goes: in a large bowl, break the chocolate into chunks, add the butter in chunks, the two spoonfuls of sugar, and the three spoonfuls of golden syrup. Heat over low heat (2 or 3 mark, or on a double boiler if you are afraid of having the chocolate burn) and stir around once in a while until the mixture is all melted and uniform. During that time, break up the biscuits in another bowl (you can put them into a ziploc bag and roll a rolling pin over them to crush them, or you can just break them by hand, they don't need to be even pieces, and the pieces should be about the size of small coin). Add the miniature marshmallows, then pour the melted chocolate mixture over the dry ingredients and swirl around with a wooden spoon until all the dry ingredients are coated. Pour the batter into the brownie tin, and push it down into the corners. It'll settle nicely but you can tap the sides of the tin to make sure it rolls into all the right spaces. If you have lined the tin, you can cover the dough with your extra cellophane. Now, place the pan in the refrigerator for a couple of hours. Once it comes out of the fridge, turn it out of the tin and then turn it right side up again, shake some sifted powder sugar over the top, cut it into bars and serve... And then get ready to M-Joy!